So. I bought the physical, limited edition of Life is Strange. Yes, I bought Life is Strange. Again. I already owned all five episodes of the game in digital format. I had already finished the game. And yet, I bought it. Again. Not only because the limited edition came with the complete soundtrack on disc and an artbook containing concept arts of the game – which is hella awesome considering that both the soundtrack and the art of Life is Strange are beyond gorgeous – but also because, above all, I wanted to support Dontnod Entertainment for having developed such an amazing, wonderful, life-changing game. I wanted to tell them, “Thank you”. Yes, dear people from Dontnod. Thank you. Thank you for having created a game which I believe might be the game of a generation, one that will change the way stories are told in video games forever. Thank you for having brought to life wonderful, likeable, lifelike, ambivalent characters. Characters that look real – not because of the number of polygons on their face as it is the case in too many games out there, but because of the emotions they feel, because of their strengths and their weaknesses, because of their dark secrets and their flawed humanity. Rarely in video games do we get to like all the characters as much as we like the protagonist – but you have accomplished that. Thank you for having so wonderfully understood that a video game is not just about fun and challenge and objectives – a video game can also be a medium to tell wonderful stories and to move the player in whole new ways. There is no “winning” a game like Life is Strange. It is not the end that matters, nor is it accomplishing a particular mission – what matters is the story. (And what matters is Syd, too. Meh. That was so lame). Thank you for how devoted you have been to raise consciousness on social issues like bullying, alcoholism, drug-using, domestic violence. You did your best to depict these issues in the most realistic and respectful way, without becoming judgmental, and by asking the player the right questions. I cannot think of another game that has treated so many unusual themes – unusual for a video game, that is – with that much realism. Congratulations to the talented graphic designers who built the colourful yet spooky environments of Life is Strange. You managed to create a mystical, fascinating, mysterious universe, with its own personality, its own beauty. The environments in Life is Strange are beautiful. Those who created them are artists. Congratulations to the talented writers and story supervisors who wrote and told the story. Not only did you tell a tale about love, about friendship, about growing older, about trying to save the ones you love, and about so many other things – but the way you told it was also creative and immersive. You fully understood the specificities of video games when it comes to storytelling. The story in Life is Strange is beautiful. Those who told it are artists. Congratulations to the talented game designers who had to overcome the difficulties of a time-travel-based gameplay, and did so brilliantly. In terms of game mechanics, Life is Strange is innovative in so many ways. The gameplay in Life is Strange is beautiful. Those who designed it are artists. Congratulations to the talented voice actors who brought the characters to life. Your performance moved me on so many levels. Without you, the characters from Life is Strange would not be the same. The characters in Life is Strange are beautiful. Those who dubbed them are artists. Congratulations to the talented composer and music supervisors for having crafted such a wonderful soundtrack, that litterally transports the player somewhere else. The songs you picked and the music you composed contribute to the overall deliciously melancholic atmosphere of the game, which would not be the same without it. The music in Life is Strange is beautiful. Those who composed it are artists. You brought me joy, tears, fear, love and so many other things. You are the kind of developers that make me realise why I love video games so much. You are the kind of developers that prove how artistic video games can be. As a gamer, I cannot wait to play more of your games, and to see how Life is Strange inspires other developers to create even more moving experiences. As a student, I must say your talent is inspiring and is making me even more eager to become an actor of the gaming industry – and perhaps, one day, work among people as talented as you. As a French guy, I am proud to see French developers being rewarded for their talent and hard-work. You totally deserve the success of Life is Strange. As a human being, I cannot help feeling moved by Life is Strange. I finished the game months ago, and I still cannot stop thinking about it. This game released a kra-can in my mind that messed with my head and heart, that messed with my soul, and I do not think that can be fixed. Nor do I want that to be fixed, either. I could go on and on and on and thank and congratulate every single person who worked on the game. I could, and I probably should, since Life is Strange really has had a powerful impact on me, far more than I even realised when I first played it. 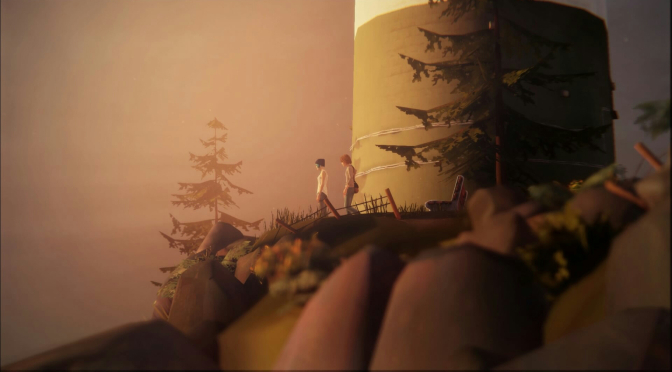 But like for all great works of art, words can be deceptive – and I wouldn’t want to betray Life is Strange. Yet, I will try my best to find the right words, as I will keep reviewing and analysing the game on my blog in the days and weeks to come. As someone who considers video games as works of art, I obviously have a lot more to say about Life is Strange. But for now, that will be all. To you, reader, I only have one thing left to say: play Life is Strange. Play it. Live it. Feel it. To you, developers and creators of the game, I must say, once again, thank you. You’re hella great. Question guimauve, mon article en lui-même n’était pas mal non plus. Tout est donc pardonné. 😉 Et merci, au contraire, pour ce commentaire !